Fanciful gilt brass fireplace screen in the style of French Rococo, with C-scrolls, flowers shell shape pad feed, and a central medallion of overflowing flower basket, French, mid-20th century. 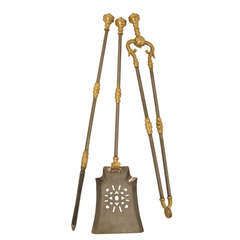 A set of English early 19th century steel and brass fire tools. 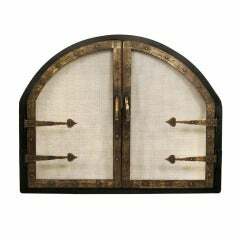 Arts & Crafts period wrought iron fireplace fender with four tools. 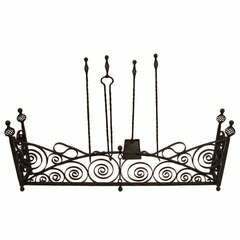 Solid wrought iron, with painted matte black finish, American, early 20th century. 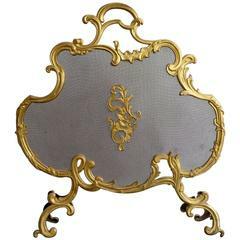 A good quality French gilt brass fire screen in the Rococo manner, with decorative motif to the centre of the mesh and elaborate frame, late 19th century. 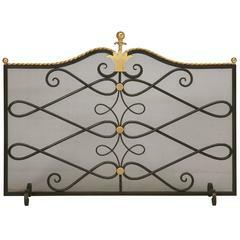 Beautiful fireplace screen made of cast iron, with decorative motifs of cat tail and flowers. Treated for rust great patina.